Nested resiliency is a new capability of Storage Spaces Direct in Windows Server 2019 that enables a two-server cluster to withstand multiple hardware failures at the same time without loss of storage availability, so users, apps, and virtual machines continue to run without disruption. This topic explains how it works, provides step-by-step instructions to get started, and answers the most frequently asked questions. Volumes that use nested resiliency can stay online and accessible even if multiple hardware failures happen at the same time, unlike classic two-way mirroring resiliency. For example, if two drives fail at the same time, or if a server goes down and a drive fails, volumes that use nested resiliency stay online and accessible. For hyper-converged infrastructure, this increases uptime for apps and virtual machines; for file server workloads, this means users enjoy uninterrupted access to their files. The trade-off is that nested resiliency has lower capacity efficiency than classic two-way mirroring, meaning you get slightly less usable space. For details, see the Capacity efficiency section below. RAID 5+1 is an established form of distributed storage resiliency that provides helpful background for understanding nested resiliency. In RAID 5+1, within each server, local resiliency is provided by RAID-5, or single parity, to protect against the loss of any single drive. Then, further resiliency is provided by RAID-1, or two-way mirroring, between the two servers to protect against the loss of either server. Nested two-way mirror. Within each server, local resiliency is provided by two-way mirroring, and then further resiliency is provided by two-way mirroring between the two servers. It's essentially a four-way mirror, with two copies in each server. 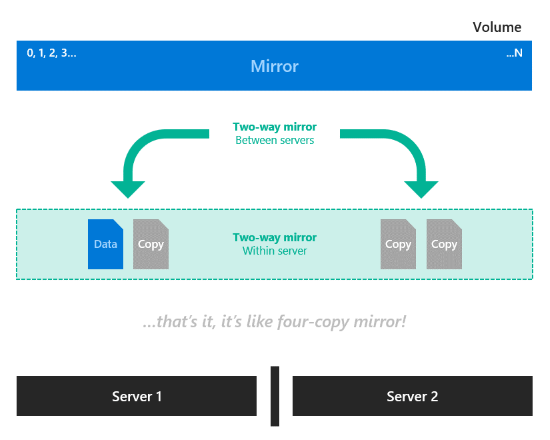 Nested two-way mirroring provides uncompromising performance: writes go to all copies, and reads come from any copy. Nested mirror-accelerated parity. Combine nested two-way mirroring, from above, with nested parity. Within each server, local resiliency for most data is provided by single bitwise parity arithmetic, except new recent writes which use two-way mirroring. Then, further resiliency for all data is provided by two-way mirroring between the servers. For more information about how mirror-accelerated parity works, see Mirror-accelerated parity. Capacity efficiency is the ratio of usable space to volume footprint. It describes the capacity overhead attributable to resiliency, and depends on the resiliency option you choose. As a simple example, storing data without resiliency is 100% capacity efficient (1 TB of data takes up 1 TB of physical storage capacity), while two-way mirroring is 50% efficient (1 TB of data takes up 2 TB of physical storage capacity). Nested two-way mirror writes four copies of everything, meaning to store 1 TB of data, you need 4 TB of physical storage capacity. Although its simplicity is appealing, nested two-way mirror's capacity efficiency of 25% is the lowest of any resiliency option in Storage Spaces Direct. If you're curious, here's an example of the full math. Suppose we have six capacity drives in each of two servers, and we want to create one 100 GB volume comprised of 10 GB of mirror and 90 GB of parity. 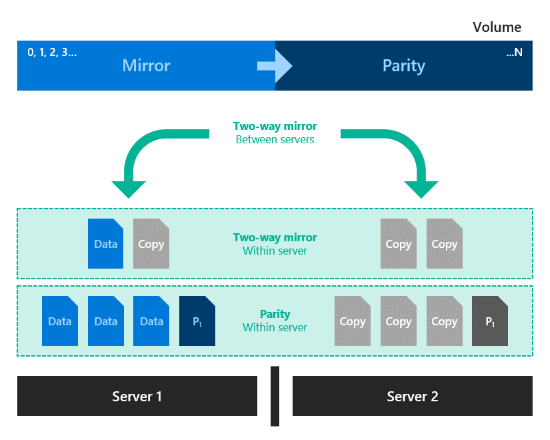 Server-local two-way mirror is 50.0% efficient, meaning the 10 GB of mirror data takes 20 GB to store on each server. Mirrored to both servers, its total footprint is 40 GB. Server-local single parity, in this case, is 5/6 = 83.3% efficient, meaning the 90 GB of parity data takes 108 GB to store on each server. Mirrored to both servers, its total footprint is 216 GB. The total footprint is thus [(10 GB / 50.0%) + (90 GB / 83.3%)] × 2 = 256 GB, for 39.1% overall capacity efficiency. Notice that the capacity efficiency of classic two-way mirroring (about 50%) and nested mirror-accelerated parity (up to 40%) are not very different. Depending on your requirements, the slightly lower capacity efficiency may be well worth the significant increase in storage availability. You choose resiliency per-volume, so you can mix nested resiliency volumes and classic two-way mirror volumes within the same cluster. You can use familiar storage cmdlets in PowerShell to create volumes with nested resiliency. First, create new storage tier templates using the New-StorageTier cmdlet. You only need to do this once, and then every new volume you create can reference these template. Specify the -MediaType of your capacity drives and, optionally, the -FriendlyName of your choice. Do not modify the other parameters. If your capacity drives are solid-state drives (SSD), set the -MediaType to SSD instead. Do not modify the other parameters. Verify the tiers created successfully with Get-StorageTier. Then, create new volumes using the New-Volume cmdlet. Volumes that use nested resiliency appear in Windows Admin Center with clear labeling, as in the screenshot below. Once they're created, you can manage and monitor them using Windows Admin Center just like any other volume in Storage Spaces Direct. With its default settings, nested resiliency protects against the loss of multiple capacity drives at the same time, or one server and one capacity drive at the same time. To extend this protection to cache drives has an additional consideration: because cache drives often provide read and write caching for multiple capacity drives, the only way to ensure you can tolerate the loss of a cache drive when the other server is down is to simply not cache writes, but that impacts performance. To address this scenario, Storage Spaces Direct offers the option to automatically disable write caching when one server in a two-server cluster is down, and then re-enable write caching once the server is back up. To allow routine restarts without performance impact, write caching isn't disabled until the server has been down for 30 minutes. Once write caching is disabled, the contents of the write cache is written to capacity devices. After this, the server can tolerate a failed cache device in the online server, though reads from the cache might be delayed or fail if a cache device fails. Get-StorageSubSystem Cluster* | Set-StorageHealthSetting -Name "System.Storage.NestedResiliency.DisableWriteCacheOnNodeDown.Enabled" -Value "True"
Can tolerate cache drive loss? Can I convert an existing volume between two-way mirror and nested resiliency? No, volumes cannot be converted between resiliency types. For new deployments on Windows Server 2019, decide ahead of time which resiliency type best fits your needs. If you're upgrading from Windows Server 2016, you can create new volumes with nested resiliency, migrate your data, and then delete the older volumes. Can I use nested resiliency with multiple types of capacity drives? Yes, just specify the -MediaType of each tier accordingly during step 1 above. For example, with NVMe, SSD, and HDD in the same cluster, the NVMe provides cache while the latter two provide capacity: set the NestedMirror tier to -MediaType SSD and the NestedParity tier to -MediaType HDD. In this case, note that parity capacity efficiency depends on the number of HDD drives only, and you need at least 4 of them per server. Can I use nested resiliency with 3 or more servers? No, only use nested resiliency if your cluster has exactly 2 servers. How many drives do I need to use nested resiliency? The minimum number of drives required for Storage Spaces Direct is 4 capacity drives per server node, plus 2 cache drives per server node (if any). This is unchanged from Windows Server 2016. There is no additional requirement for nested resiliency, and the recommendation for reserve capacity is unchanged too. Does nested resiliency change how drive replacement works? Does nested resiliency change how server node replacement works? For details see the Remove servers topic.